This weekend has been incredibly cozy. I came home Friday after work, got into my pajamas (begin as you mean to go on, right? ), and settled in for a snowy weekend inside. Friday night was spent cleaning and organizing, because I can't relax if my apartment isn't tidy, and I guess the organizing bug was still in my system on Saturday morning, because I decided to take on a pretty mammoth task: organizing my yarn stash. That entailed taking every single skein and braid out of my yarn cabinet-- have I mentioned that I have a lot of yarn and spinning fiber? I'm hoping to do a little stash tour soon, too. The up close and personal view of my many, many yards of yarn and ounces of fiber was a little intimidating, to be honest, but it was also exciting. 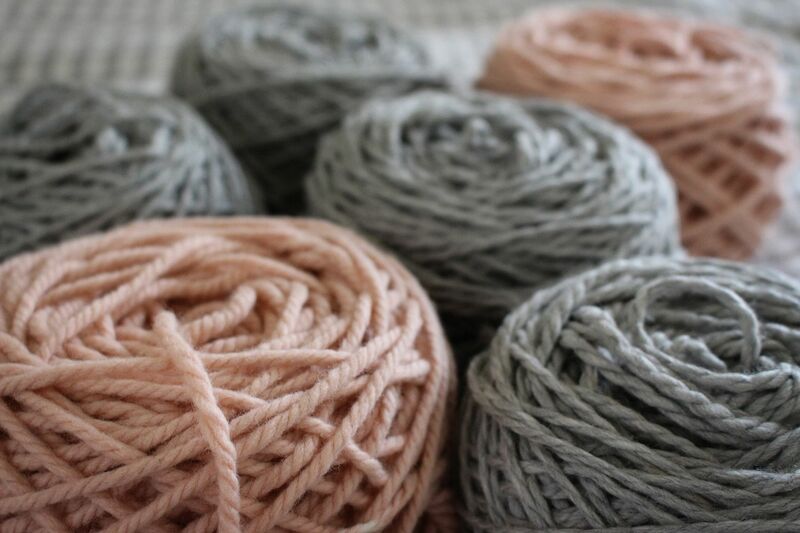 It also gave me a chance to see trends in my yarn purchasing, and while I have a lot of lavender and a lot of pale blue, the majority of my stash is gray and blush. Since I have so much of it, and because gray and blush go with pretty much everything in my wardrobe, I decided to cast on a few projects. 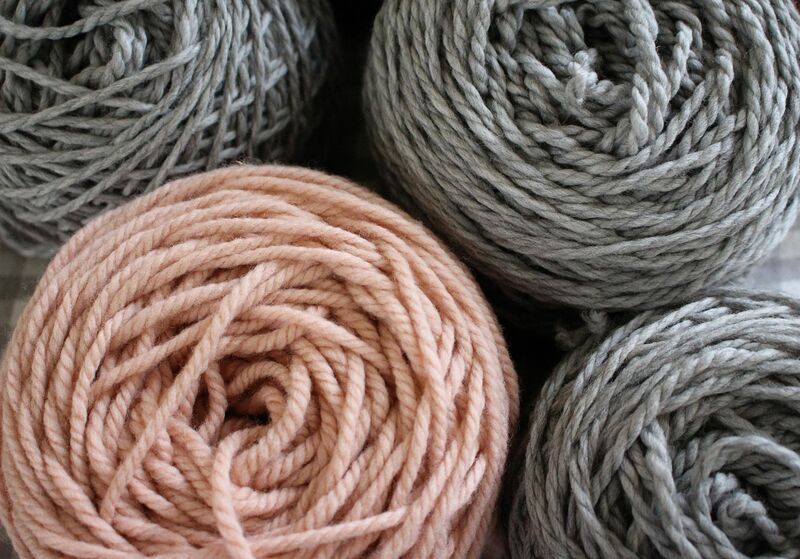 The two soft, lovely yarns above are O-Wool Legacy Bulky in Desert Blush and Cascade 128 Bulky in Silver. The Cascade 128 Bulky was a gift from my lovely friend and coworker Kristina-- she knit a gorgeous fisherman's rib scarf out of it and when I said that I loved it, she passed along her four extra skeins to me! Kristina, that was so generous of you, thank you so much. These are going to become the Color Dipped Scarf from Purl Soho. 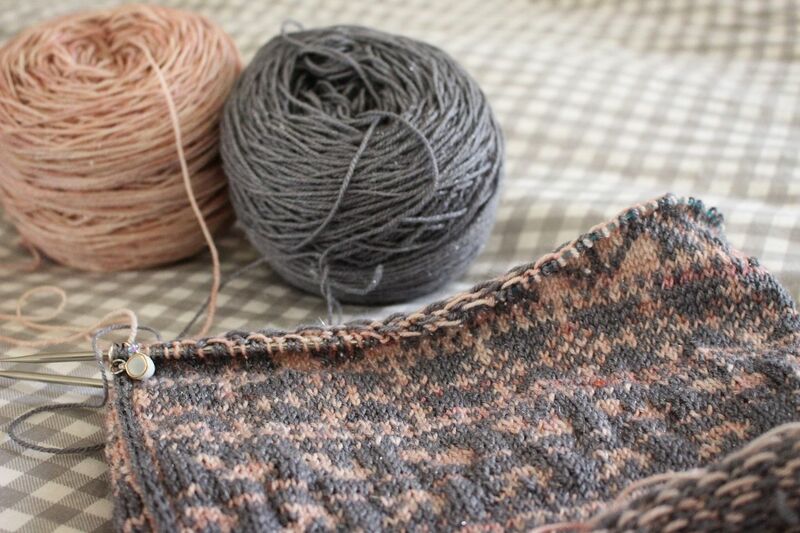 This will be my first try at brioche knitting and I'm pretty excited about it! I spent most of this weekend knitting on the Crazed Scandinavian Cowl by Wendy Johnson. I'm still relatively new at colorwork, as this is only my fourth colorwork project, so I find myself un-knitting quite often and my tension is occasionally a little wonky (which will hopefully even out in blocking). I'm enjoying it nonetheless, and these yarns make it such a pleasant project to knit on. The blush yarn is Kraemer Sterling Sock in the Pink Pearl colorway, purchased at Vogue Knitting Live in January of 2015 at the Woolbearers booth. The gray is from Holiday Yarns, in the Silver Sock base, in the Badger Black colorway--and that color name makes my little Hufflepuff heart very happy. I purchased this yarn at Vogue Knitting Live 2016, just over a week ago. (I'll be sharing the rest of my purchases with you in my next post, and guess what? Gray and blush. All of it.) These are definitely dyed up on the same base from Kraemer, consisting of merino, silk, and nylon, so the two yarns work perfectly together. This is an at-home-only project for me, so I've also cast on some socks for my mom so that I'll have something to knit on the train and while watching podcasts, since I need to follow a chart closely for this cowl. Now that I'm finally finished with my Christmas knitting, I want to cast on all the things!